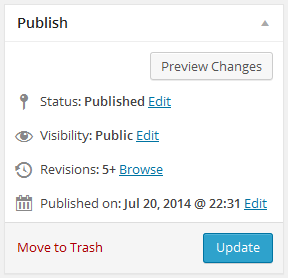 The WordPress Revisions system stores a record of each saved draft or published update. The revisions page also includes a ‘compare any two revisions’ mode that allows you to compare any two individual revisions. Revisions can be used to restore an older version of the content. WordPress apparently sets no limit on the number of revisions stored in the database (I have one page currently at 423 revisions). With a website that has hundreds of authors; constantly adding new content to keep articles fresh; I can only imagine how high this number can reach. Page revisions are stored in the database in the same table with other posts, pages and custom post types. So, whenever a query is made to this table (very frequently), it must also sort through all of the page revisions. With the processing speed of computers and servers these days; we most likely will not see a performance decrease. However, if you’re like me, and prefer to keep a clean database; WP Edit Pro can help. WP Edit Pro offers a few different options when tweaking how page revisions should be handled. WP Edit Pro allows the administrator to set how many post revisions should be kept at maximum. Simply enter a number into the input field; and this will be the maximum number of post revisions that will be stored in the database (for each post). When the maximum number of post revisions is reached, the oldest will be replaced with the newest revision. To set the max post revisions, go to the plugin settings page -> Posts/Pages tab. Now when editing a post, the revisions will stop at the number selected and display a “+” sign. The plus sign is to signify that only this number of revisions are kept. “5” set as max post revisions to keep. WP Edit Pro also allows the maximum number of page revisions to keep. Options work exactly the same as described above for “Max Post Revisions”. Using WP Edit Pro, we can quickly and easily delete all database revisions. NOTE: Deleting all database revisions is an irreversible process. All revisions will be permanently deleted from the database. Just a fun little piece of information. This option will show you how much database size page revisions currently occupy. I think revisions are helpful.. to an extent. Five seems to be the magic number for me, but I am a single author on the website. Perhaps more authors requires more revisions to keep? Share your experiences in our comment section.